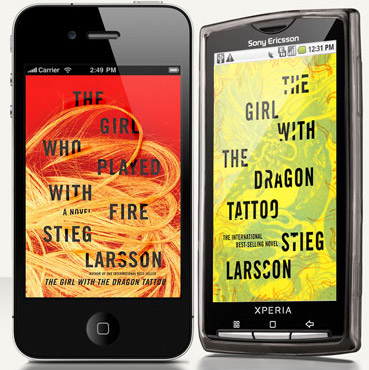 Sony, the company that all but started the eReading industry, has finally gotten around to joining the mobile reading app marketplace! This December, according to their admittedly sparse preview page, we’ll get to play with Sony Reader for iPhone and Sony Reader for Android in addition to their hardware options. It will have the expected features we’ve gotten used to in existing reading app offerings: text resizing, bookmarks, highlighting, and annotation. It does have a nice looking interface though, from what we can see, and may present other unique features as well! I really like what Sony has done for the eReading marketplace in the past. I really don’t think it would exist in quite the form it does today without them. It has been a long time since they were leading the pack, though, and they’re late to the game on this point. Hopefully, that just means that this will be something that’s been given enough development time to really impress, somehow rather than just being a means for owners of the Sony Reader devices to read their purchased books on other platforms. Not that there’s anything wrong with that, of course, but it would do them some good to pull a bit of attention away from the Nook and Kindle front-runners. More competition is always a good thing. It’s hardly new to anybody that the eReader market is a place where everybody is scrambling to make their mark and stake a claim. Some successfully nudge their way into the public eye via good marketing and good feature sets, like the nook, and some simply fail in the face of so much pressure. It remains to be seen how Sharp will do, but they’re clearly interested in finding out! We know little about their announced eReader besides that it is going to be LCD-based, has presented with a touch-screen in prototypes, and will feature an entirely new format and distribution system, if all goes according to Sharp’s plans. The basic idea of the design seems to be going along the lines of Amazon’s(NASDAQ:AMZN) recent addition of A/V integration to the Kindle software, but with a format based on an accepted Japanese standard for eBooks and eComics. This file system, a next-gen XMDF, is said to allow audio and video integration that will be accessible across multiple devices including user PCs and, obviously, their eReader tablets. Where does this leave the existing market? Even assuming that this takes off, and the interest garnered by Amazon’s A/V efforts demonstrate that there’s a market for somebody willing to cater to such things, I think that the Kindle has little to worry about. The traditional LCD, the new format and distribution system starting from scratch, and the fact that they’re facing off against established competition all work against Sharp’s design. I, however, am intrigued and wish them luck. I’d like to see where this takes things. Moving back to the other side of the usual competition, after Amazon’s(NASDAQ:AMZN) recent announcement of this fall’s upcoming slimmer and more streamlined Kindle, Barnes & Noble(NYSE:BKS) has begun a limited time offering(from June 2nd through July 3rd) of a $50 Gift Card with every nook device purchased through either themselves or their partners and Best Buy. There is, of course, plenty of opportunity to read into this as more than a marketing push, paving the way for the WiFi-only nook we’ve been hearing about or a jump to a lower price point in general, but without anything to set schedules by, it’s a bit hard to assess. Regardless of the reasoning behind the offer, anybody who was on the fence about picking up this eReader will now have that much more incentive to run out and give it a try. For those who order their device online, you will need to create a BN.com account with attached credit card and you may expect the gift card to be included in the packaging with your new nook. This might not be the best time to upgrade, or even to simply join the eReading populace, given the new technology right around the corner, but if the urge is there then this is one more reason to go for it. 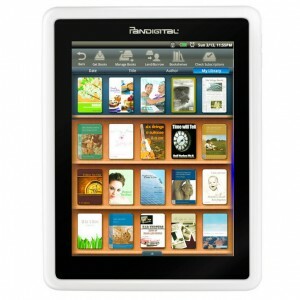 Pandigital, a company until now known for their digital photo frames, has entered the eReader market with their new device: the Novel. This 7-inch tablet device features what is described as a responsive touchscreen, 1GB of internal storage, a 6-hour battery, a full web browser, and the ability to store and view both pictures and video, among other things. At first glance, it’s honestly kinda cool. Almost like getting an iPad without all the extra expense, maybe. Given the price, however, and the emphasis on it’s status as an eReading device, we find some shortcomings by comparison. A $199.99 MSRP is a good start, however it hardly makes this a revolutionary introduction to the marketplace with the Kobo coming in at $149.99 and the anticipated nook Lite matching the $199.99 asking price. 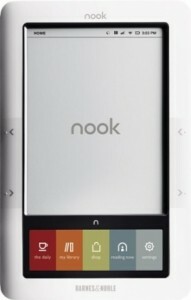 Oddly enough, what is said to make the nook price drop so much in the move to the Lite model is the lack of 3G wireless support, which the Novel lacks in the first place. Makes some sense. Also, not to belabor a point that most people have probably realized on their own by now, it is an LCD display. This means that while it’s likely to be pleasant to look at and great for displaying full-color texts(especially magazines and such that rely on this), it is going to be harder on the eyes than something like the Kindle. No, I haven’t held one in my hands yet, but with LCDs it’s the nature of the beast. Some are better than others, but for reading eInk puts them all to shame. The thing that stands out the most for me, however, is the battery life. One of the most pleasant parts of owning an eBook Reader is the fact that you can treat it just like a book for the most part. My Kindle comes out once a week for charging, if that, and otherwise sits in my bag or on the bookshelf, always ready to go. I don’t have to come home and worry about plugging things in. Needless to say, I’m unimpressed by what’s being presented here so far. It’s a neat little device, but it’s too late to make a splash. There are better eReaders out there for the same price, better multi-purpose tablets for just a bit more. Unless you spend extremely long periods of time with books or magazines that require color displays, this will probably be something you pass on. 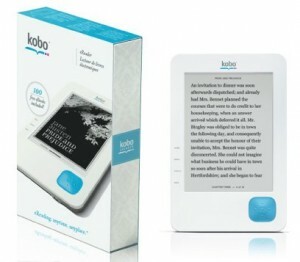 Slated for release this May and already available for pre-order, the Kobo eReader provides an inexpensive option for those looking to enjoy the eReader option without breaking the bank. It’s not a Kindle-killer or even trying to be a contender in the recent eReader/Tablet competition being played up all over the internet at the moment, but rather a basic, simple take on reading a novel. You can get books in these standard formats from pretty much anywhere on the net, including all the popular sources for free literature like Project Gutenberg and Manybooks.net, but the main promoted source will clearly be the Kobo website. No shortage of reading material is always an upside! The downside however, from the gadget lover’s point of view, is that they make no attempt to turn the device into a catch-all for every day tasks. This is quite plainly an ebook Reading Device. Nothing more. No 3g coverage, no downloadable apps, nothing but what you need. We have only pre-release reviews and technical specs to go by at this point, but it looks like a promising addition to the eReader scene. If you or somebody you care to buy for likes to read a lot for pleasure, this will almost certainly be a welcome product. It won’t check your email, find you a path to the movies, play your home movies, or run games. If that doesn’t turn you away, it might be worth a close look.